Artist Diana Barron has an idea for a Lilo & Stitch sequel set in space. 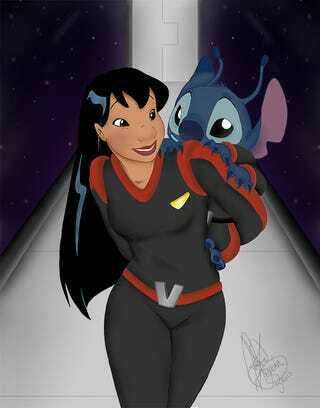 She imagines an adult Lilo training to become an officer in the Galactic Armada, with Stitch along for the ride. When Lilo graduated from High School, Grand Councilwoman immediately calls her and tells her that she is really interested for her to become a future Captain of the Galactic Armada, but for her to do that she will first have to attend G.A.C.C. (Galactic Alliance Community College). Lilo is happy for the offer, but says that she will only accept if Stitch could go with her. With the Councilwoman's approval, both friends waste no time to pack their bags, excited of what their future awaits. The Hawaiian setting is part of what makes Lilo & Stitch so wonderful, but we'd still love to see Lilo, with all of her pluck and imagination, on a space adventure. Barron has much, much more Lilo & Stitch fanart—including grown-up Lilo—on her blog, where she has also posted additional images and story ideas for Lilo's space adventure. She even has a story idea involving Stitch's evil twin, Leroy. Be sure to check it all out.